APPEARANCE: Kidōmaru is an oni who appears in Kokon chomonjū (“A Collection of Notable Tales Old and New”), a Kamakura Period complication of myths and legends of the Heian Period. He was a member of Shuten dōji’s clan, and is said to be Shuten dōji’s son. He is known for his attempts to take revenge upon the samurai who defeated his father. LEGENDS: Kidōmaru’s was born after the legendary samurai Minamoto no Yorimitsu (also known as Raikō) and his party of heroes had subjugated Shuten dōji and freed all of the women captured by his oni gang. The women were grateful to the samurai for rescuing them, and returned home to their villages. One of the women, however, didn’t return to her home. Instead, she traveled to the village of Kumohara, where she gave birth to a baby oni—Shuten dōji’s son! The boy was named Kidōmaru. He was born with a full set of teeth, and an oni’s strength. By the time he was 7 or 8 years old, he could slay a deer or a boar by throwing a single rock at it. He was apprenticed as a temple servant to Mt. Hiei, just like his father was. And just like his father, he was eventually expelled from the temple for being a wicked, wretched little boy. He fled into the mountains and lived in a cave, turning to robbing people to survive. He studied magic and honed his powers in his secret hideout. Many years later, Raikō was visiting his younger brother Yorinobu. 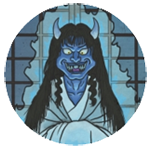 Yorinobu had captured the oni bandit Kidōmaru and locked him in his bathroom. Raikō scolded his brother for being so careless and not properly subduing the oni with ropes and chains. Raikō showed Yorinobu how to tie up an oni, and made sure Kidōmaru couldn’t escape. Then Raikō spent the night just to make sure nothing bad would happen. That night, Kidōmaru easily broke the bonds that were holding him. He wanted revenge, so he snuck up to Raikō’s room and spied on him. Raikō noticed the oni spying on him and decided to lay a trap. In a loud voice he told his attendants that the following morning they would ride to Mount Kurama to make a pilgrimage. Hearing this, Kidōmaru ran ahead to Kurama to plan an ambush for Raikō. On the road outside of Ichiharano, Kidōmaru slaughtered a cow and climbed inside of its body to hide and wait. When Raikō and his companions arrived at Ichiharano, they easily saw through Kidōmaru’s disguise. Raikō’s best archer, Watanabe no Tsuna, shot an arrow through the cow’s body, injuring the oni. 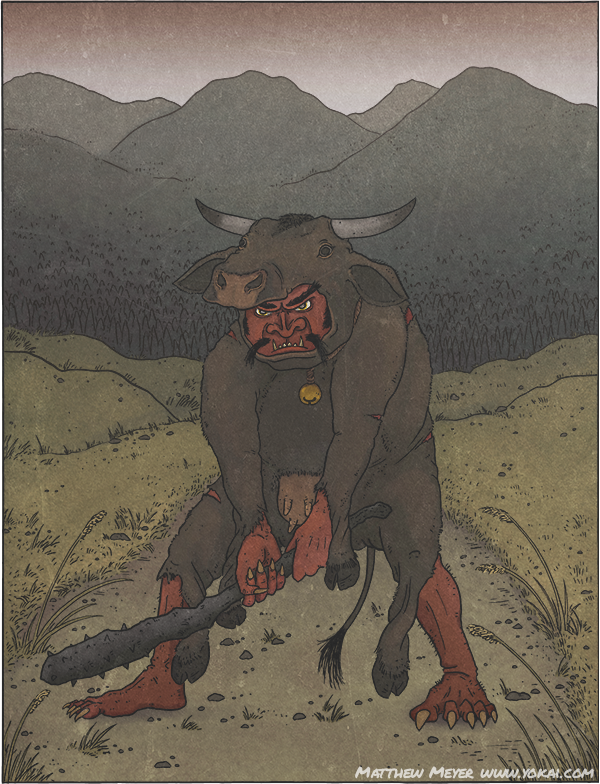 Kidōmaru emerged from the cow’s corpse and charged at Raikō with all of his might. However, Raikō was too fast: he cut Kidōmaru down with a single stroke of his blade.